SUNFARMING FOOD AND ENERGY PROJECT TAKES ROOT IN UGANDA - Facilitated by the Presidential Initiative on Banana Industrial Development and the Uganda Embassy in Berlin. Amb. 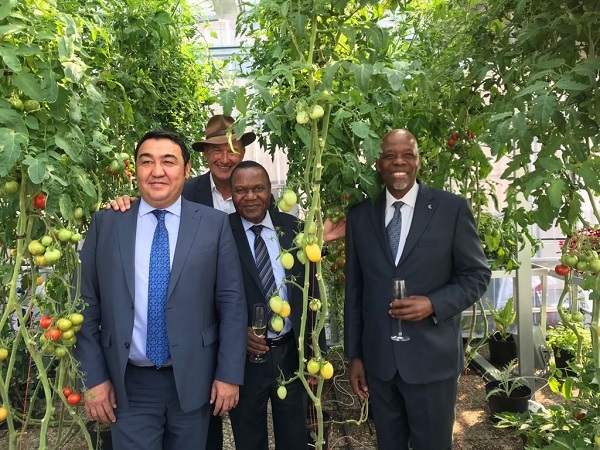 Tibaleka and his hosts, on the roof-top of the Estrel Hotel, Berlin, during the launch of the roof-top agro-solar greenhouse, SUNdome. Amb. Marcel R. Tibaleka, on 29th August 2018, attended the opening of SUNfarming GmbH's Food & Energy roof-top agro-solar greenhouse, SUNdome. The construction of this state of the art structure started in 2017 on the roof of one of the largest hotels in Europe, the Estrel Hotel. It represents SUNfarming's innovative concept of urban farming, which can be modified and fine-tuned to suit the demands of countries around the World. During the event, Mr. Peter Schrum, Chairman of SUNfarming briefed the Ambassador about his delegation's visit to Uganda between Monday 20th - Friday 24th August 2018 where they met with several stakeholders who have interest in the SUNfarmimg Food and Energy project. These meetings were jointly facilitated between the host Presidential Initiative on Banana Industrial Development (PIBID) and the Uganda Embassy in Berlin. Mr. Schrum said that the SUNfarming Food and Energy project had received support from all participants and unanimous agreement that the program will address food security, technical training, job creation, alleviate some energy issues, value add at the Ministry of Science, Technology and Innovation with its value proposition. Hon. Minister Tumwesigye had authorized 50 ha off the 163 ha land allocated to PIBID for the SUNfarming energy plant. Hon. Tumwesigye embraced the SUNfarming investment and its technological advances that he said will benefits different aspects of the economy. The participants who supported the project include Professor Florence Muranga, Dr Joseph Bahati, Dr. John Kawongolo, Mr William Mwegombi, Mrs Patience Tusingwire, Mr Ali-AusTushabe (PIBID), Professor Barnabas Nawangwe (Makerere University), Dr. Nkuhe Johnson, Mrs. Jovanice Twinobusingye (National Agricultural Genetic Resources Centre) and Ms. Cathrine Kawine and Mr. Safari Mugyenyi (RDCs).